The image relates to the story in that the person on the left is who went off to serve while the person on the right is who (or what) came back. Apologies if it's a bit choppy. The ground transport kept as good a pace as possible as it traveled the unpaved road on the fringe of hill and canyon country that bordered mountains, slowed from completing its mission whenever it had to plow through minor obstructions small machines or animals simply went over or around. The transport slowed only to veer around rocky outcrops or boulders that would have damaged it, otherwise it bored forward toward its destination. The person who nominally would have been considered the driver of a comparable civilian vehicle checked the transport’s autopilot settings before he glanced over at what was normally the relief driver’s seat. The seat’s occupant swayed with the vehicle and stared blankly at the forward viewscreen as if the enhanced image of the outside world meant nothing. And as far as the driver knew, the world outside the transport might have meant nothing to the person who hadn’t said a word over the last several hours. The driver shrugged as he turned his attention back to the viewscreen to watch the road ahead just in case he needed to override the autopilot and drive manually. He had one last drop to make with one last soldier to return to a home of record before returning to the ship that would take him away from Limbo, he hoped forever. He glanced over at his last passenger, who unlike his last few deliveries appeared physically unmarked. She simply stared vacuously as if her mind had fled during whatever battle had marked her soul. A green light flashed on the instrument panel as the ground transport slowed to negotiate a turn into a smaller track that was rougher than the previous road had been. The ground transport bulled its way down the track, which was far smoother after its passage. “All I was told was I got injured in a firefight and I was one of the lucky ones who lived.” She blinked as the image on the viewscreen showed the track passing through a narrow defile. “Okay, route set.” The driver looked over at his soon to be delivered passenger. “Maybe I shouldn’t say this but…the end of this war doesn’t mean everybody is happy and we all go home. The scuttlebutt is we are now short a couple interstellar corporations, as well as a few planets, if not more. There will be at least a few corporate warships with no home base to return to. She watched the transport as it all but squeaked its bulk through a narrow gap between rock formations and disappeared into the moonlit semi-darkness. After a few moments she turned back to face the expanse of ground that lay between her and what she had to assume was a dwelling of some sort, even though all she could see was a dimly lit recessed doorway flanked by shadowy walls or banks. She looked down at the field pack, duffel bag, and jump bag at her feet, then looked up as the spot where she stood brightened. She wavered between simply walking away and calling out before her legs folded and she sat down hard. She stared numbly at the light washed ground beyond her boots even as a long shadow approached and stopped a few feet away. She looked up dully at the backlit form though all she could see of the child’s face were shadows. Moments later a second larger shadow with a hunting rifle stood next to the child. “Jarvis, not one step closer to that woman until…tell me why we should just take you into our home. How do we know you aren’t a threat.” The woman’s mistrust was stronger. The sheltering asylum of darkness that enfolded her grudgingly gave way to a dim rosy glow. Sound returned slowly before a sigh of breath told her she wasn’t alone. Her eyelids parted enough to reveal a ceiling overhead. She turned her head enough to face the speaker and saw a man about thirty years old, whose black hair and blue eyes were in contrast with his tanned olive complexion. The faint lines that bracketed his mouth hinted the man spent more time smiling than frowning. In the female model, um, how to say this? It looks like "Lefty" was much better nourished than "Moe." Some of the descriptive sentences are a bit convoluted and indirect. "The ground transport kept as good a pace as possible" and following might be better something like "The ground transport made fairly good speed, despite..."
Another example: "The person who nominally would have been considered the driver of a comparable civilian vehicle checked the transport’s autopilot settings before he glanced over at what was normally the relief driver’s seat." I would suggest something like, "The driver -- or the closest thing the transport had to a driver -- checked the auto pilot and then glanced at the passenger beside him." More direct, more pointed. Actually, consider shorter sentences throughout. It's a failing in my writing also: wanting to complete a complex thought in one go. But sometimes you have to cut it in half and polish the cut ends. The dialog could use a little polish -- the speakers are distinct enough but could use more variation. Scenery could use more description -- is the house blue, white, red, green, big, small, ramshackle, nicely painted, well-kept? Details like that. In general, high marks. I'd put this at 98% finished, just a small bit to finish it off, mostly smoothing the finish and putting on some polish. No errors of spelling, grammar, and usage, of course. I guess for a really-rough draft I didn't do too bad. I think it was an issue due to the tank top as the original artist didn't try to 'fit' the materials as well as the lighting. Hopefully this reflects the character's mental situation somewhat better. Ah, I figured out how to 'denoise' the image. Now with luck I can write today. Of the three this is probably the best. The composition, character and mood are very nice. I would suggest considering adding a little more texture to the girl's hair, however, since it looks a little too much like a plastic shell at the moment. You might also want to do a little post-rendering work on her as well, to eliminate the odd-looking hump in her back (this sort of thing is pretty much a typical flaw of most figure-generating software, such as Poser, MakeHuman, etc., and not your fault). 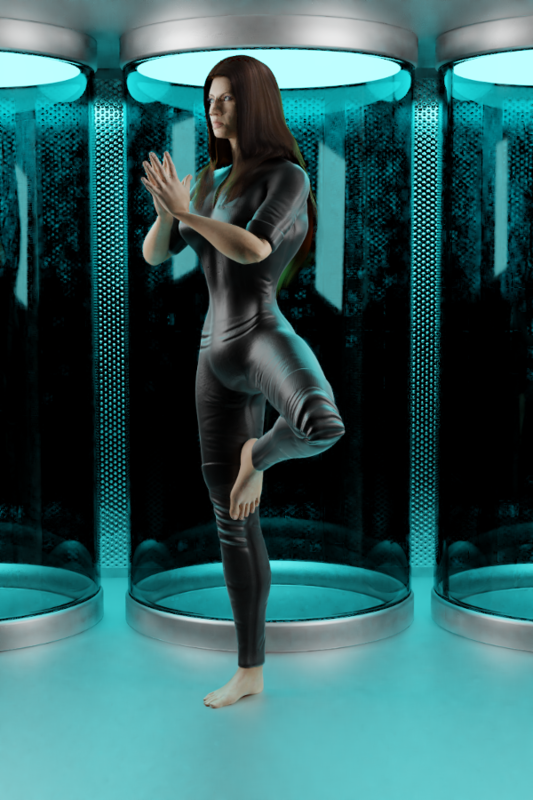 As I can I'll set the scene up again, this time with Surface Subdivision on the different parts of the person. Not sure how to deal with the hump yet, more research. Sometimes the most time-effective way to do something is to not try to get your software to do everything---which can often take forever. Removing the hump by hand to give her a more natural-looking shoulder took only seconds. Brush or airbrush? Something I'm not so good at, yet. The hair is another matter. Whether short (military type cut) or long braid, when in the seated pose even with surface subdivision the hair looks rubbery. Someone else (another beginner) was asking about how to make and export poses. If it proves easy enough (forehead not pounding keyboard) I'll try something similar. Most of the stock poses are designed with an 'average size' character in mind and often enough mine have fingers stuck inside the body or face. Getting the dead man's family picture in the scene was also fun. A test I did prior to the last image. Not completely sure if it's the pose, the camera angle, or a combination of the two. The fix was done mainly with the rubber stamp tool: I simply copied part of the background over the figure's excess back. I then replaced the highlight along the edge of her back. I did this with the airbrush tool...but it could also possibly have been done with the dodge tool. It would probably be worth getting some experience in using tools such as these since in the long run you would save a great deal of time and effort. One possibly simple way to take care of the hair would be to place an image of real hair over that of the figure's and use layers to combine the two (that way, the shades and highlights of the figure's hair will be retained). I'll check through the different tools in GIMP and InkScape. I did determine the cause of the hump. The software used to make the character has different rigs similar to a skeleton to allow posing and animation in other software like blender. 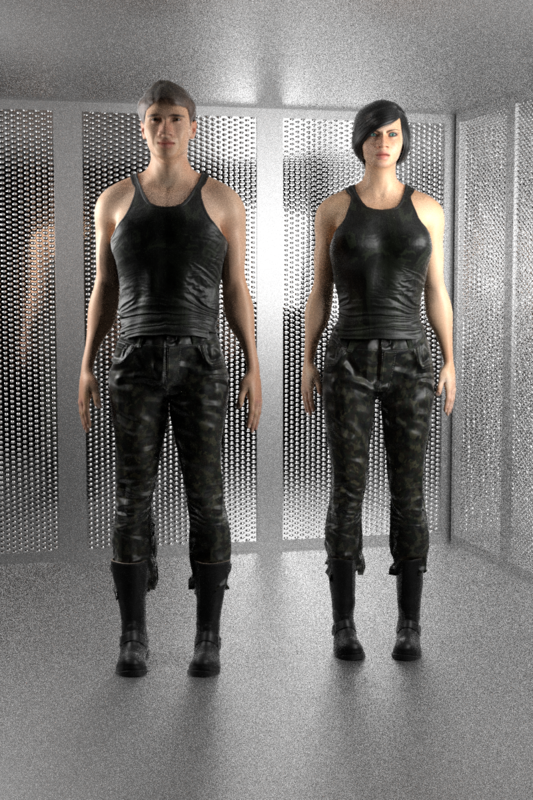 The difference is the rig's 'spine' lacks the normal curves and recurves of the human spine, leading to distortions when the character is posed in certain ways. That's one of the dangers in using software such as Poser, etc. Unless one is really careful, some bizarre distortions can result. Do check with what GIMP can do for you. Often, touching up a rendering is easier and more efficient than trying to force a program to give you what you want. I've noticed some of those distortions while trying to set a pose before getting a bit of a clue on how to set poses. Another aspect is scale, some people use meter while others use decimeter and importing with a scale mismatch has some obvious and some less than obvious results. At present I'm trying to figure out what's causing the hair anomalies, though an Alpha 7 pattern (whatever that is) seems to actually look like hair. In this case it's an attempt to understand what I'm doing wrong in the program in order to make future efforts more efficient. I still have to make a 3D model of a ray-gun. There's little I can add here, except for one nitpicky comment: In the family photo -- People being photographed tend to have a fairly narrow stance, whereas the family photo has everyone braced as if to sumo wrestle. Legs together in the photo would give it a more natural look, in my opinion. Those nitpicky details do tend to make or break how realistic an image is so good catch there. Hi, total noob here, so you can disregard my opinion, but, I like this line,"The sheltering asylum of darkness that enfolded her grudgingly gave way to a dim rosy glow." a lot.